Plagued by loneliness, fear, and self-doubt, 150 cynical teenagers entered a freshman class in Long Beach more than 20 years ago to find a peppy new English teacher, unaware of how that room and that teacher would drastically alter their futures and those of so many others around the globe. Following the LA riots and in the midst of the gang tensions and racial strife still so prevalent in Long Beach in the 1990s, those students were not as concerned about test scores and homework as they were about their day-to-day survival. 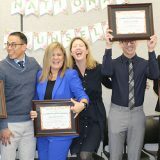 Yet, over the course of their high school careers, their teacher Erin Gruwell would find a way to engage them, to connect their life experiences to a broader community, and to knit them together as a family. 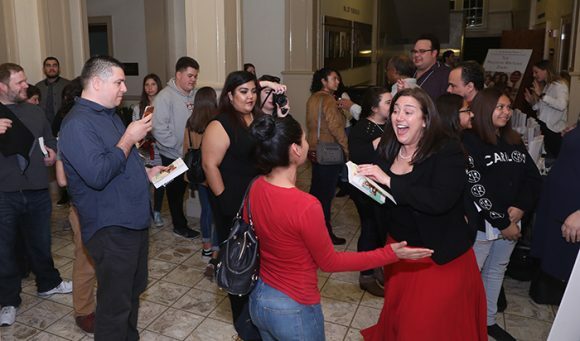 The dramatic story of Erin Gruwell and those students, who would eventually call themselves the Freedom Writers and publish a book under that name, from Woodrow Wilson High School’s Room 203 was shared during an exclusive screening of the new PBS documentary Freedom Writers: Stories from the Heart at Chapman University. Following the screening, which was co-sponsored by Chapman’s Office the President, Attallah College of Educational Studies, and University Honors Program, Chapman President Daniele Struppa moderated a panel discussion with Erin Gruwell; Sue Ellen Alpizar, one of the original Freedom Writers; and Carl Cohn, who served as the Long Beach Unified School District superintendent during Gruwell’s tenure at Wilson. 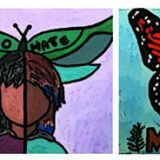 The Freedom Writers documentary featured the voices of Gruwell’s 150 high school students, who had been deemed “unteachable” by some, and highlighted the pivotal moments that changed their perspectives on the power of education and how their lives might unfold. Ultimately, all 150 Freedom Writers earned a high school diploma, resulting in a record number of graduating seniors at Wilson up to that point. Most went on to college, and more than half now have college degrees. Alongside many of her Freedom Writers original students, Gruwell later formed the Freedom Writers Foundation to foster an educational philosophy that values and promotes diversity, fights for equality in education, and inspires teachers and students all over the world. 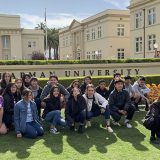 Alpizar’s story and that of the other Freedom Writers featured in the documentary deeply moved many of the Chapman students, faculty, and community members. 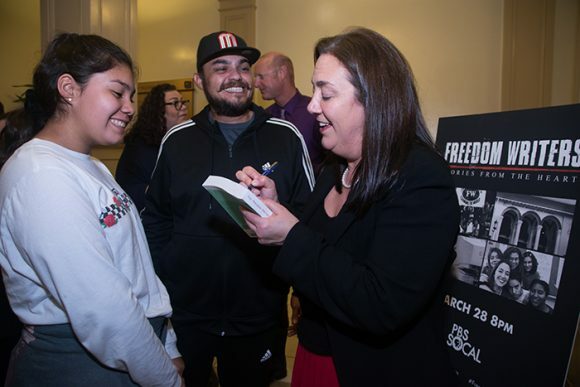 Those who attended the Freedom Writers event said they did not expect to be brought to laughter and tears. Tony Arteaga, himself the first of his family to go to college, attended the event with his daughter’s middle school class. 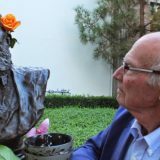 He didn’t know what to expect but found himself relating to the students in the documentary. The Chapman community also expressed gratitude for the opportunity to learn more about the Freedom Writers story and talk directly with Gruwell, Cohn, and Alpizar. 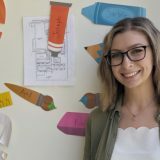 Senior communication major Shelby Brown and senior SCC major Alyssa Karpas said they enjoyed hearing about Gruwell’s leadership style from Gruwell herself instead of learning about it in a classroom lecture. 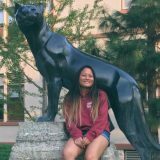 “I think it’s a really cool opportunity that being students at Chapman we have access to things like this,” Brown said. “Hearing her tell her story was really inspiring, and it’s cool that Chapman is involved in the Freedom Writers program. Alyssa Karpas said that prior to the Freedom Writers event, Gruwell visited her leadership class. The documentary screening and panel discussion are just one sign of the deepening connection between the foundation and Chapman. 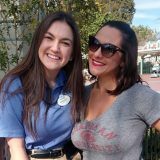 Many Chapman students have had the opportunity to work as foundation interns, and following graduation, several have even gone on to join the foundation’s full-time staff. Attallah College also welcomed Erin Gruwell earlier this year when it awarded her the Changing the World Award at the annual Attallah Scholarship and Award Luncheon. “We are privileged to have been the first audience of the Freedom Writers documentary,” said Attallah College Dean Margaret Grogan. 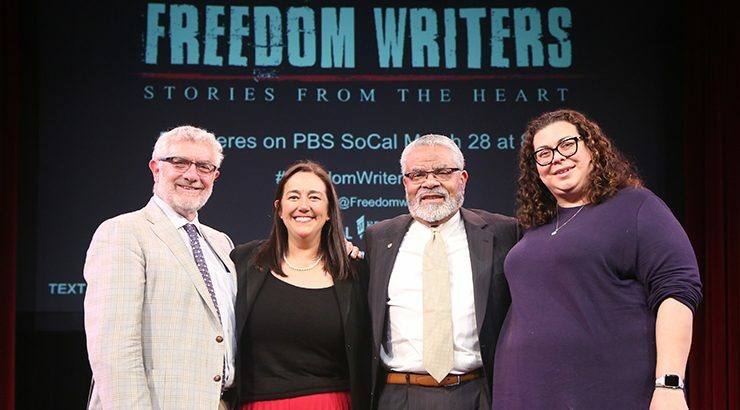 The Freedom Writers: Stories from the Heart documentary will air on PBS in the Los Angeles area on Thursday, March 28, 2019 and then again nationally during fall 2019.